Recipe Inspirations makes trying McCormick's best recipes fun and easy. Each packet includes pre-measured, all-natural, salt-free McCormick spices and herbs and a collectible recipe card. Create an anytime fiesta with delicious south-of-the-border spices and herbs, chicken and fresh vegetables. 1. Mix juices, oil, all of the Spices and salt in small bowl. Reserve 1/4 cup of the marinade. Place chicken in large resealable plastic bag or glass dish. Add remaining marinade; turn to coat well. Refrigerate 30 minutes or longer for extra flavor. 2. Cook and stir chicken in large heated skillet on medium-high heat 3 minutes or until lightly browned. Remove from skillet. Add bell pepper, onion and reserved marinade; cook and stir 5 minutes or until tender. Return chicken to skillet. Cook 2 to 3 minutes or until heated through. 3. 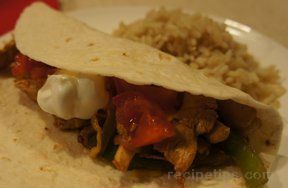 Spoon chicken mixture into warm tortillas. Serve with assorted toppings, if desired.